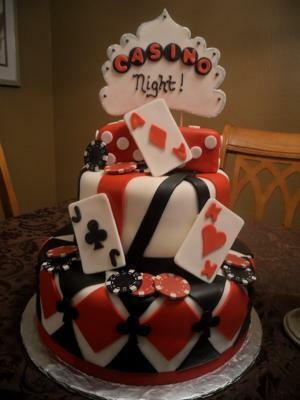 This casino night cake is an 8 inch round for the top tier and a 12 inch round for bottom tier. Top tier is french vanilla with chocolate bavarian cream, bottom tier is Devils food cake with vanilla bavarian cream filling. I dyed black and red fondant. 5 days in advance I made the playing cards and sign on top to give it enough time to dry completely. Just by cutting out the shapes from fondant. 2 days before cake was due I made the die to go on top. I shaped rice crispy treats into cubes. Put buttercream icing on them then covered in 2 layers of fondant. You want to use 2 layers as just one layer will look bumpy from the rice crispies. Cut white fondant with circle cutter for the numbers on sides. Day before cake is due I finished the rest. Covered both tiers in white fondant. I worked on decorating bottom tier before stacking the top tier. I added a satin red ribbon to bottom border. Cut black diamonds from fondant then cut those in half. Place above ribbon. Cut red diamonds out and place those on the finally more black diamonds. Stack the top tier. I just cut thicker red strips of fondant and placed on top randomly, then thinner blacks strips and placed those randomly. Add the die to the top and place the Casino Nights sign on top. Add the playing cards and I used a few real poker chips. You could easily make those of fondant too if you wanted. I had so much fun making this cake! Oh forgot to mention I used edible silver glitter on the outline of the sign, it really make the cake shine! it's worth the time and effort...BIG congrats ! What a great cake, I really like it! Congrats! Congratulations! You did a wonderful job. This cake is beautiful.